No Photoshop skills? No worries! Adobe Creative Cloud programs such as Photoshop & Premiere Pro are more accessible, and in some ways more affordable, thanks to their subscription models. But they still take time to learn and aren’t completely intuitive. If you are wanting complete control of your graphics and videos then I would recommend learning Photoshop or Premiere Pro, or outsourcing to a professional (like me!). Canva is a very popular tool (started by an Aussie) for creating good looking, modern graphics quickly. You can quickly create everything from resumes to logos, infographics and inspirational quotes for your Instagram. The free version has an amazing amount of templates and gives a broad selection of file type options for downloading. If you’re not well versed in creating graphics then I’d recommend starting with Canva. PRICE: Free; Premium accounts available to add your own font, colours & logo. My imaginary coffee shop had a logo with in five minutes. I use Adobe Spark if I need to whip up something fairly simple; it’s a lot easier than fussing about in Photoshop. The program is skewed towards social media graphics and you can create basic videos as well which I really like. I much prefer the Adobe Spark interface over Canva and find it easier to use. I’ve been loyal to Adobe Spark for a while and I have the Premium version which is just under AUD$15 a month. But I may be making the switch to Canva Premium to get more bang for my buck. PRICE: Free; Premium accounts also available to add your own font, colours & logo. I really dislike looking at data (boring, sorry!) unless it’s made into an infographic! Although Canva does infographics, I find Piktochart much easier as it’s designed specifically for them. The free version is fairly limited and downloads come with a watermark (which you can crop off but I resisted as it’s a tad unethical). But it is very easy to drag and drop and have a design in minuets. 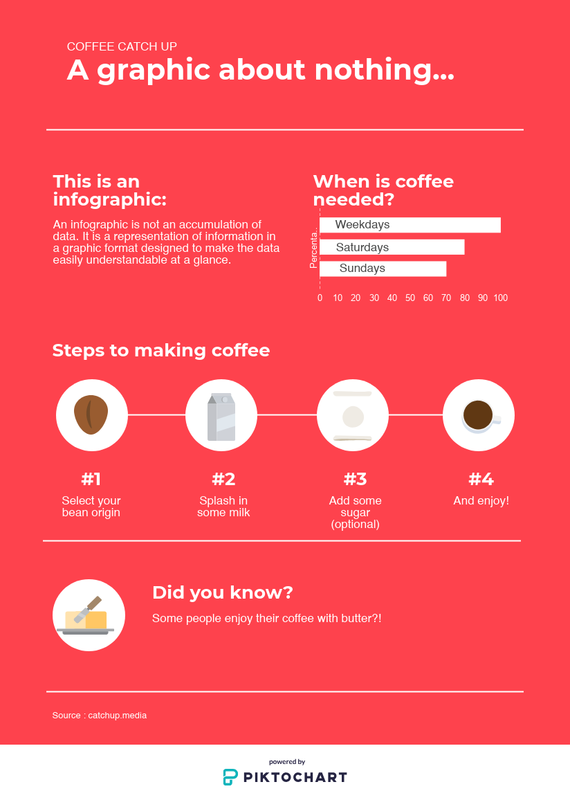 You can have a nice looking infographic whipped up in seconds. PRICE: Free; Premium accounts also available for more templates and customisation. If you are going to start using one of these programs for social media, I highly recommend having a content and social media strategy in place first so you can post with purpose! Contact me today so we can get you sorted with a comprehensive plan.